There was a segment on the latest episode of AWR’s Wavescan (9 April 2017) about the Titus II DRM receiver recorded during the recent HFCC meeting in Jordan. In it, it was stated that the shipment of the first 1500 units was expected at the end of March or by the first half of April. Included some discussion of added shielding to prevent digital noise and the high-sensitivity of the receiver compared to other DRM units. The Titus II is an Android Tablet + SDR combination that is due to be released in the near future. 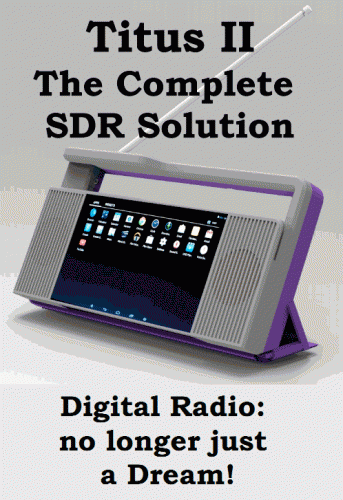 Its main purpose is for reception of Digital Radio Mondiale (DRM) which is a digital broadcasting medium used on the HF frequencies, which somewhat replaces standard short wave AM radio. The Titus II hopes to be one of the first low cost receiver solutions for this market and as a wideband SDR it should work for many other applications too. From the advertised frequency range of 100 kHz – 2 GHz we speculate that it will be using the Mirics SDR chipset, which is the same chipset as used in the SDRplay. The target price is under $100 USD. Back in September 2016 we posted about the PatronX Titus II portable software defined radio which appears to currently be on its way to beginning production. It is a portable Android tablet based SDR, which we speculate is using similar chips to the SDRplay RSP with its 100 kHz to 2 GHz tuning range. The price goal is set to be under $100 USD. Currently it is available for ‘pre-order’ on the HFCC website, although what they call a pre-order is actually just an expression of interest, and no payment is required. As you can imagine the response to Titus has almost been overwhelming! Pre-orders far exceeded our imagination and excitement from broadcasters has been very loud. DRM and digital broadcasting seems to be reinvigorated with Titus in 2017. I think we really broke the price barrier that most everyone has been dreaming of and provided the flexibility that has held back the cause. Earlier in the month we posted about the Titus II SDR. The Titus II is an upcoming full SDR solution, including a wideband 100 kHz to 2 GHz SDR, Android tablet with touchscreen and speakers. They write that the price will be under $100 USD. 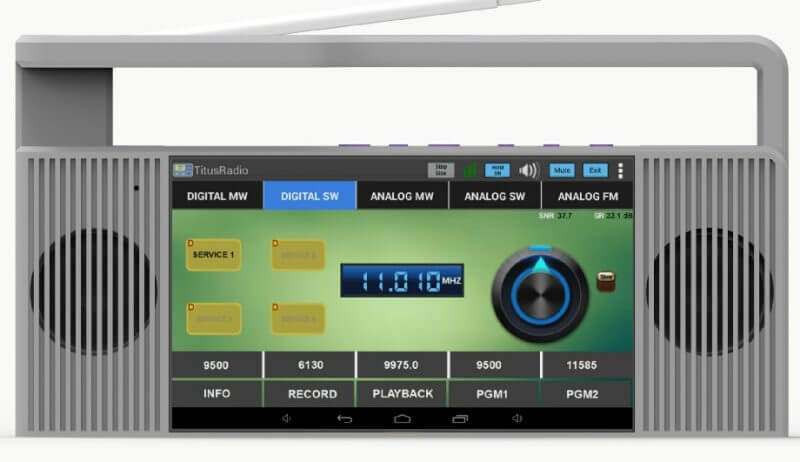 The Titus II – an Android tablet computer with wideband SDR receiver – was unveiled for the first time at the B16 HFCC/ASBU conference in Miami, Florida, 22-26 August 2016. The receiver has been the result of cooperation between Trans World Radio (TWR) and PantronX. The HFCC is assisting in collecting the demand/pre-orders. An initial order sufficient to start the production has already been placed and production will start irrespective of the amount pre-ordered via this page. Pre-order is not binding and you are NOT asked to send any advanced payment or credit card number to secure the pre-order. Recently we’ve heard news of a new portable SDR called the PantronX Titus II which is currently in development. 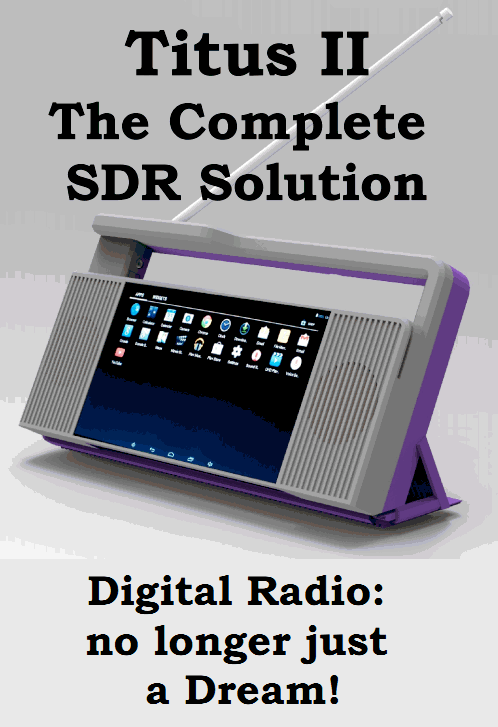 The receiver is a full SDR solution, including the computer, speakers, antenna and SDR all in a single boombox styled enclosure. The computer appears to be based on an Android tablet, and comes with a Quad-core ARM A53 @ 1.2 GHz CPU, 1 GB RAM, 8 GB Flash memory, 7″ TFT screen, touch screen, 5 watt stereo audio, li-poly battery. HDMI output, microUSB OTG connector, WiFI/Bluetooth connectivitiy as well as having an optional camera. The frequency range extends from 100 kHz to 2 GHz, and the built in software is capable of decoding AM/FM/SSB and DRM. Since it is essentially an SDR with an Android tablet, it should also be capable of decoding any other signal, as long as software decoders are written for it. We are unsure what SDR is used on the inside, but judging by its frequency range we speculate that it may be the same Mirics chips that are used inside the SDRplay RSP. Rumour currently has it from word of mouth of the developers that this unit will priced “well below $100 USD”. The promotional PDF can be found here.